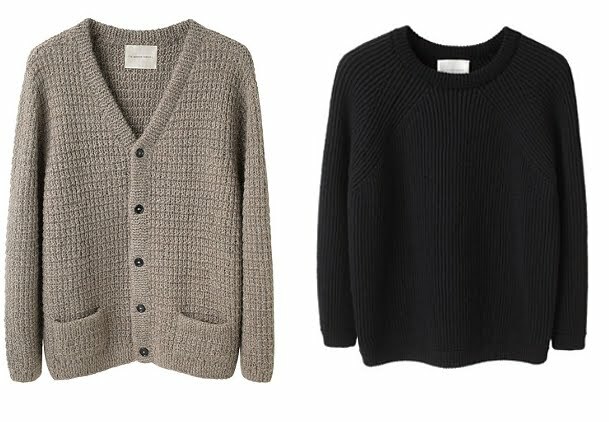 Those sweaters from the La Garconne in house label (named Moderne) seem to be perfect - a little slouchy, made with all-natural materials (alpaca and merino wool) and assembled locally. They do cost an astronomical amount, but with care and an occasional rotation, it seems to me like they should last for at least a few good years. I'm particularly drawn the to the beige cardigan which is hand-knitted in Peru of baby alpaca wool (much softer and less scratchy than regular alpaca). I can envision it paired a silk top, a slim pair of black pants and my Hope Chy boots - it's a combination that would probably keep me warm all through autumn, winter and spring. Other than that, I'm basically keeping my consumption habit at a minimum by avoiding blogging and blogs in general, and focusing on saving for that coveted Sofia Coppola duffel (now in a smaller size and perfect for every day use!). I think just staying away from blogs and having a goal has been good for my wallet, but perhaps not very wise when it comes to blog readership. I was a little taken aback by the pricing for Moderne, I suppose I'm not sure if quality aside, an in-house brand by La Garconne commands that kind of premium for me. All the same, I did love the look of the knits. At least I don't have to agonise over them since I don't need anything that heavy! I sometimes wish I didn't have my "sizeable day bag" needs covered, I rather love the SC bag. It felt a little stiff when I checked it out in the shops, but then I saw a woman carry one that she had been using for a year and it looks much nicer worn in. The only thing I didnt like about it is that the way the bag opens doesn't allow you to take things in and out too easily but that's because I'm used to totes with much larger open tops. All said, it's very much worth saving for! I'm saving for the SC PM, too! I'm just about there, but I feel a little foolish even thinking about spending so much on a bag. The amount of money I spend on clothes and accessories has jumped quite a bit over the years, and I'm not sure that I like what it says about my priorities. But, at the end of the day, it's been years, and it's still my ideal bag. It's gorgeous and I love it and I'd use it forever. Do you feel conflicted about it at all or is it just me? Oh man, those sweaters are so beautiful. But, jeez...$475 for a cardigan? I'll just have to admire from afar. Does the SC duffel come in navy this season? I was under the impression that they do a different color each season. I think La Garconne figures that their customer base can afford it even when half the country are losing their jobs. Everything in the "luxury" category seems to be going up in price. The SC bag apparently softens up and sags after a while and turns into a lovely mush. I'm still torn but we'll see. Well, I think that La Garconne's general customer base are people who think $475 for a sweater is peanuts. The SC duffel always comes in chocolate and dark navy leather - the new colors are cream, cerise and white. Very nice picks for the season. I think those sweaters are lovely ... what I have more a problem with is patronizing la garconne, after someone who used to work there posted on my blog that the owner isn't very nice and is quite greedy. The pricing on those sweaters definitely makes me think back to the owner! I've bought from them since and probably will again, but it's always a deterrent, especially when there are stores I'd rather support, like Totokaelo. The SC is beautiful ... I like how you readily admit that it's not worth the price (but when is love rational?). I'm curious to see, once you've saved up, whether you'll be able to plunk down the money. That's the ultimate test, right? All the comments makes me want to post an interview with Jill Wenger of Totokaelo that I recently read. While she's brutally honest, it makes me NOT want to shop at any high end/luxury store. La Garconne has appalling customer service and by all accounts, a really nasty owner. I think she can get away with it because it's still niche market when it comes to high-end minimalist clothing. The price of the SC bag has doubled since I last wanted it and I think it's only going to go up more - I'll probably grab it before too long and subsist on ramen, eggs and frozen spinach for a year. Has it really doubled since it was issued? Woah. I remember the last increase and having to modify my savings spreadsheet with a sinking heart. Also, I agree that the saving up process has been a good discipline excercise. Whatever happens, I'd like to retain the "would I rather have the SC or x?" mentality as I think it's helped me avoid a few mistakes. Ih, I got the lagarconne mailer too. So nice, but way too much money. I'd rather get an A.P.C cardigan or sweater. The SC bag is my dream bag too. I ws going to save up for it, but it hasn't happened yet. I still don't think I could plunk down the money, even if I'd save up for it. I wish I could save up for the SC bag, but unfortunately I'm a poor undergrad and my pockets are just not deep enough atm. I think it would really suit your style though judging from the outfits you post! especially with the outfit in your last outfit post. I actually think/hope there might be a limit on how high the price goes. I mean the current price is very very high, but surely there is a limit. I read somewhere that the SC bag is the LV bag which is closest to the quality of Hermes which makes me think the price is ok, much more justified than Chanel prices. About the Totokaelo interview, why did it make you not want to shop at any high end/luxury store? Thanks for stopping by! I think the other reason why the SC bag is so expensive is that it's produced in very small batches - the LV SA was telling me that once they sell out, it takes a really long time for it to come back in stock. I wouldn't worry about saving up for the SC bag at the moment, you probably have more important things to think about. This is not meant to be a negative comment, but I was curious, how can you possibly afford the SC bag being a grad student? When I was a grad student I made just enough money to pay rent and eat. I'm just wondering. After reading the comments I have to confess that it was me who posted on S blog about previously working at lg. It was something that I did for a short time in between jobs, mostly motivated by the fact that I could unpack the boxes and replenish my wardrobe at a discount. That being said, they didn't want to let employees purchase anything. There is no storefront and we worked in a nondescript warehouse, so no need to dress for the clientele. It was strange and no one was happy there - perhaps because there were no windows and half of the girls were starving themselves. The owners kept as minimal staff as possible in order to keep overhead low. There were a few celebrity clients and a lot of international clients, so perhaps people that don't bat an eyelash about that price for a sweater - I think that they actually catered more to the international customer. I don't want to trash them, but it was just a strange place and an overall unhappy experience, so I am not surprised that translates to customer service. The PM bag is lovely and will be interested to hear how you feel once you have saved enough. S - I can't look at your blog anymore - help? I'm glad you asked actually because I was going to do a post about this - I don't think it gets brought up enough, I fortunately have a rather well to do spouse and a good financial support system ala mom. I'm shameless when it comes to buying something I really want but I think that just makes me sound like a completely vapid spoilt brat. Hi Leanne, thanks for your input - I actually read on some other site/forum (don't remember) about bad working experiences at LG, it might have been you but if it's not, take heart that other people feel the same way =) I think you're going to get starving, unhappy people anywhere you go in the fashion world. Thank you for addressing this! I can't wait to here your thoughts on this. I sometimes feel like I'm the only one out there reading these types of blogs who cannot afford super-luxury items - and I am a working mom. I look to blogs for inspiration, but sometimes it's alienation when you see items with astronomical price tags - I find it a bit alienating. On top of that, it seems to me that there are a number of grad student bloggers out there who can afford high end luxury items and it's just shocking to me. I presume most of them have extra help but this is never mentioned in their blogs. So I look forward to your post on this. Thank you! Maybe it's harder now that I'm a parent, but I don't think I would have thought differently before. I just can't see that a bag could be worth that kind of money. I don't know when I'd wear it. Not to work, I'd be afraid I'd ruin it. When I meet my friends we're usually with the kids, and that's not the time to wear a SC bag! We go out to dinner quite often, but then I wear a smaller bag. I think that it is just perfect, but not for me right now. Maybe when the kids are older and I got more time to myself! Yes! Both sweaters cught my eye as soon as the site went live, but I can't wear alpaca or merino. personally i didn't shop for months now... planning to get my dream winter coat from rick owens collection.